1. Do I like “bad novels,” i.e. novels that break rules and are full of angry screeds about “assholes” and hilarious digressions about hyper intelligent strains of gonorrhea? 2. Is this novel as paranoid as the Internet and is that imitation intentional and useful? 3. Why am I thinking in lists and does that have something to do with the Internet? 4. How dirty is American history? 5. Can literature rescue us from the anti-intellectual monsters of the Internet, the trolls and the Trumps? 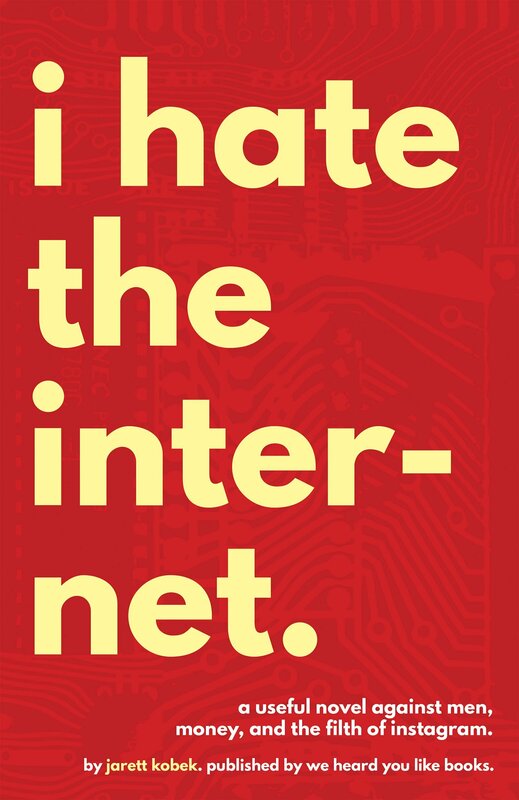 As a Turkish-American writer with “eumelanin in the basale strata of his epidermis,” Kobek has some ethos to reflect on America’s cult of “multiculturalism.” He understands the language of Internet technology better than any writer I’ve ever encountered. However, as much as I enjoyed this “useful novel against men,” I did wish that Adeline, his comic book artist protagonist, had been drawn with more care. Kobek’s novel, like Alexandra Pelosi’s documentary, San Francisco 2.0, describes a city that has been whitewashed and gutted by the same insidious forces that are destroying New York City and other major metropolises throughout the country and the world, banishing artists and ethnic communities where they’re needed the most: at the centers of power. By the end of I Hate the Internet I wanted to get to know Adeline better, wanted to feel more for her and her community of swindled artists. Kobek’s constant screeds about the exploitation of intellectual property (totally justified) have a way of turning Adeline into little more than intellectual property. Of course, this is all literary characters are in the end, but the illusion that they’re more may (or may not) have helped the CIA sell a lot of novels in the 50s and 60s, because many of us like to get lost in other lives (like spies), and this novel, intentionally or not, does not often permit us such escapes. Kobek’s relentless deconstruction of everything (race, religion, the history of comics, Twitter, Miley Cyrus) leaves us little time to feel the fake as real. But maybe the Internet’s already got that base covered. 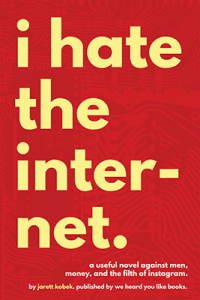 Here’s a hashtag for all future fans of this “bad novel”: #iloveihatetheinternet. M.C. Armstrong’s fiction and nonfiction have been published by Esquire, The Missouri Review, and The Gettysburg Review, among others. The winner of a Pushcart Prize, he embedded with JSOF in Al Anbar Province, Iraq, and reported extensively on the Iraq War for The Winchester Star. He is the guitarist and lead vocalist for the band Viva la Muerte. Find out more at mcarmstrong.com or follow him on Twitter at @mcarmystrong.